Let’s talk about how to bullet journal – the easy way. 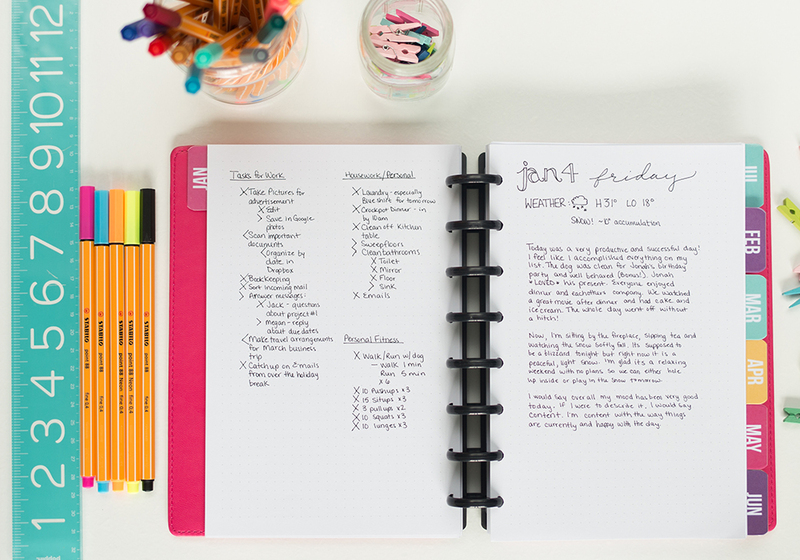 If you’ve never even heard of bullet journaling, keep reading – you’re in for a real treat! If you have heard of it, but you’re not sure if it’s for you, I’m here to help. First, I think I need to clear up a common bullet journaling myth. When you first learn about it, it’s easy to assume that it would be complicated and time-consuming and that you practically need to be a professional artist in order to do it. Here’s the thing about bullet journaling: it is one of the most flexible planning systems out there, which means it is exactly what you make it. 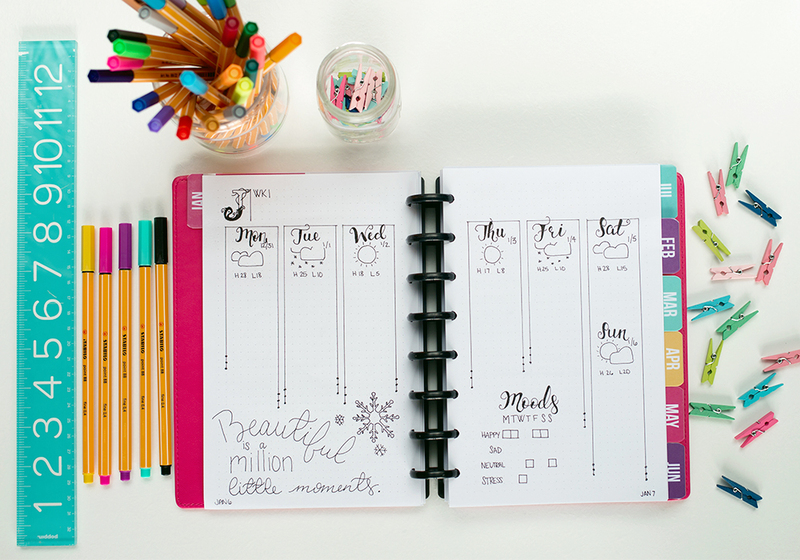 You can even combine it with a planner to make it even quicker and easier (which is my favorite way to use it). Certainly, there are bullet journalers (is that what you call people who bullet journal?) who create elaborate works of art each week in their own journal. I think those people are absolutely amazing! However, there are also simple ways to bullet journal. 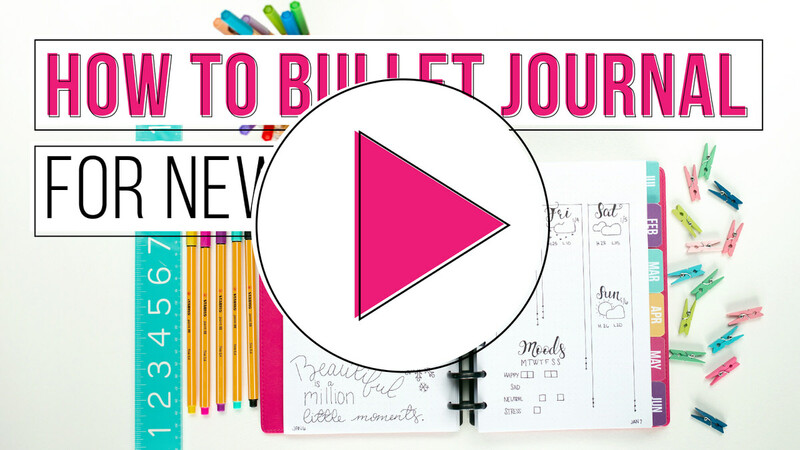 Want to just watch a video to learn all about bullet journaling? Click the video below to watch my quick how-to. In its purest form, all you need to bullet journal is a notebook and a pen. Most people prefer to use grid paper or dot grid paper (which is just little tiny dots that form a grid) in their notebook to help keep things looking neat. If you are purely bullet journaling, you wouldn’t use any printables or pages already done for you. That means you would create every single page yourself (think daily dockets, calendars, weekly layouts, habit trackers, and more) from scratch. In that case, it would be super helpful to have a ruler and maybe even a protractor for some of the more complicated circular layouts. I can already sense some of you were getting ready to click away the instant I said “ruler.” And if that didn’t scare you away, the mention of a protractor probably did! 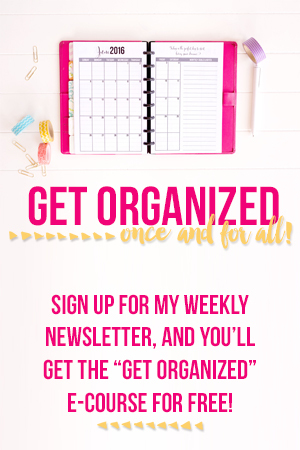 Don’t worry – once I explain the basics of a bullet journal, I’ll show you how you can use these concepts in combination with a planner to eliminate the need for you to draw calendars or anything else. 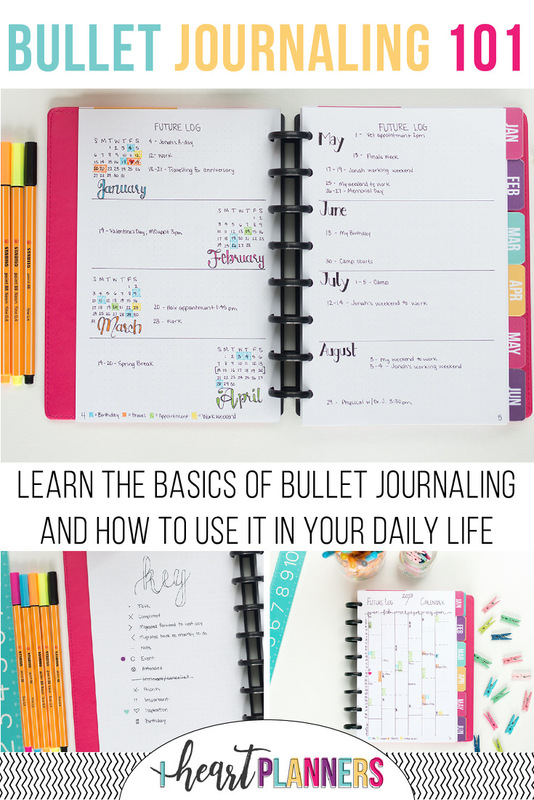 A bullet journal is an all in one notebook or binder used to track anything and everything. 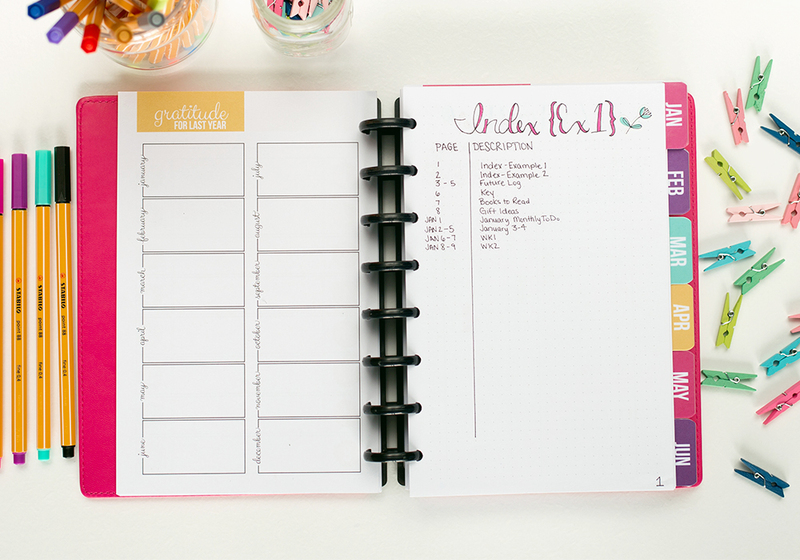 It replaces your planner, home management binder, notes, and lots of little lists you might have around your home. It makes it easy to find whatever you need quickly. 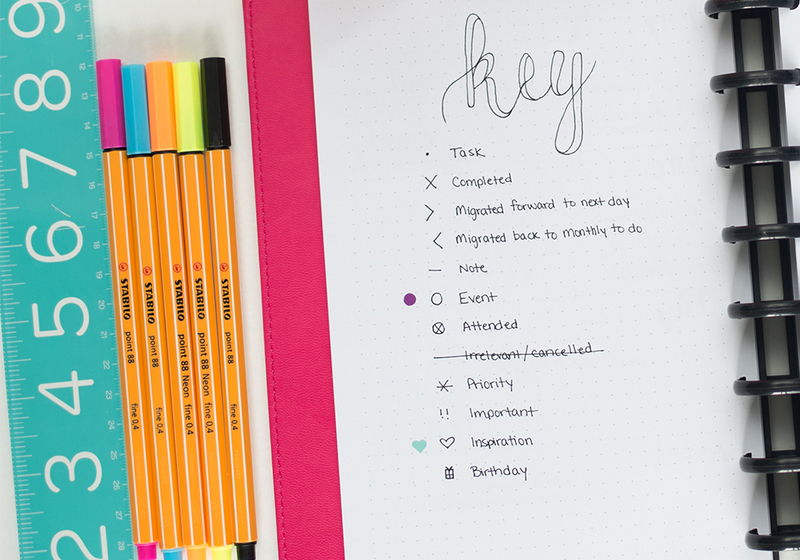 The other beauty of a bullet journal is that there are no rules – do it your way! INDEX: This is the backbone of your Bullet Journal. As your journal grows with plans and notes you always make reference to what pages you can find those specific notes on in your Index. This makes finding exactly what you need that you just knew you wrote down super easy. FUTURE LOG – This is really just a fancy way of saying advanced or annual planning. You usually put this toward the front of your journal, and this is where you write out things that will happen in the future (not the month you’re in). When you’re using a bullet journal where you have to create every single page, most people don’t create monthly calendars too much in advance, so this is really necessary to keep up with future events. 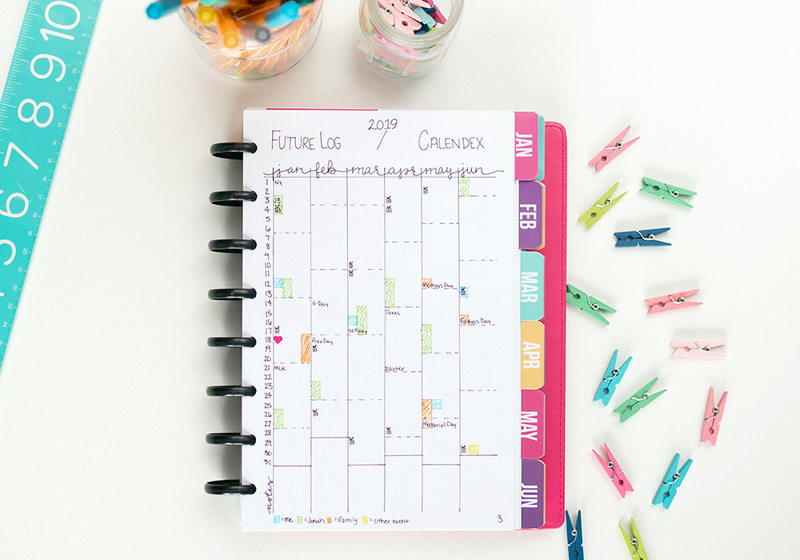 In a more traditional planner or a combined bullet journal/ planner method like this one, this isn’t absolutely necessary because you can simply put the events directly in the months where they go since those are already in your bujo planner. MONTHLY LOG – This is a fancy way of saying “monthly calendar.” Here you write out events on a calendar page and tasks you want to get done on your task page, or you can use a more traditional calendar layout. DAILY LOG – This is what you use every day to keep track of events, tasks and make notes. Some people use one page per day while others make weekly spreads and anything in between. Really it’s just a fancy way of saying daily planning page. The real backbone of the bullet journal system is the symbols you use beside each task or item. The technical term for using those symbols is “rapid logging” (but I just call them symbols.) 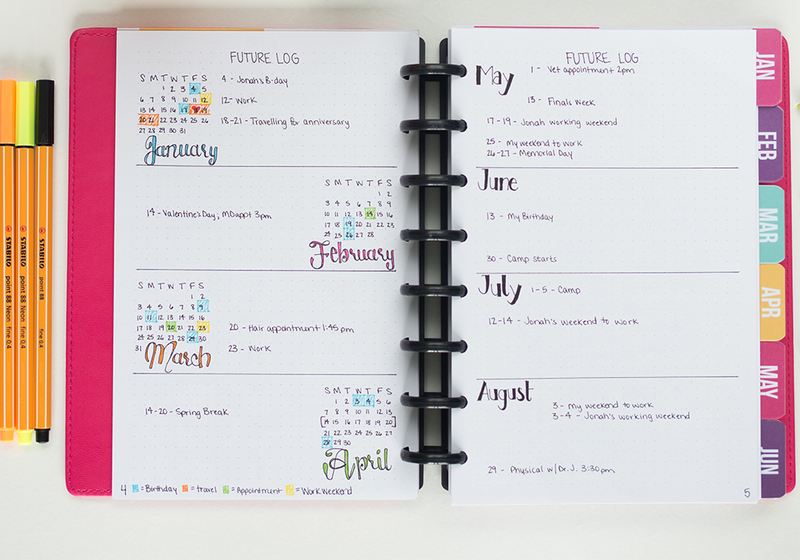 You can use this system in any planner or notebook – even if you’re not formally bullet journaling. Here are the most common symbols used, but you can create any symbols you would like as long as you can remember them and keep up with them. Most people keep a page like this with the key near the front of their journal for easy reference (and you can click below to download a printable version for yourself). As a bonus, we’ve created a printable BuJo Key with the most popular symbols used for you to download and use to start your own bullet journal today! Just click to enter your details and get your freebie today! HABIT TRACKER – This is one of the most popular bullet journal layouts used to help people track habits they want to improve. 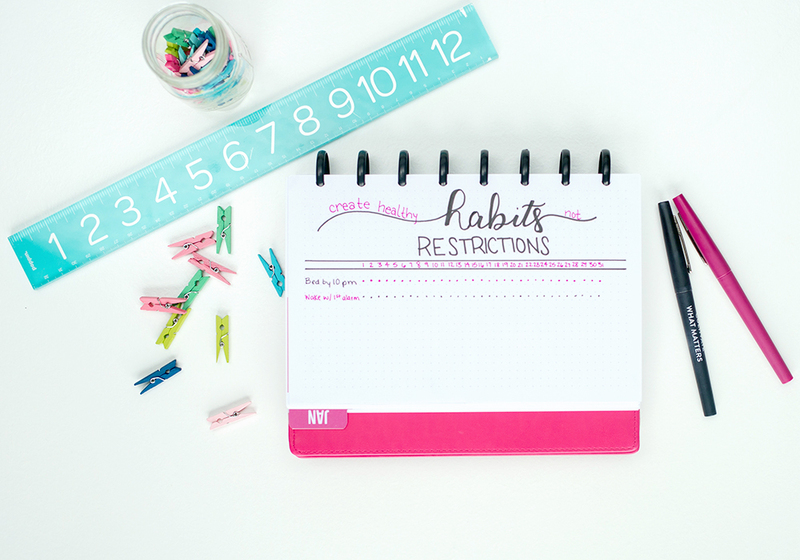 Usually, it’s a grid with several habits listed across the side and a little square to check off for each day of the month that you do the habit. 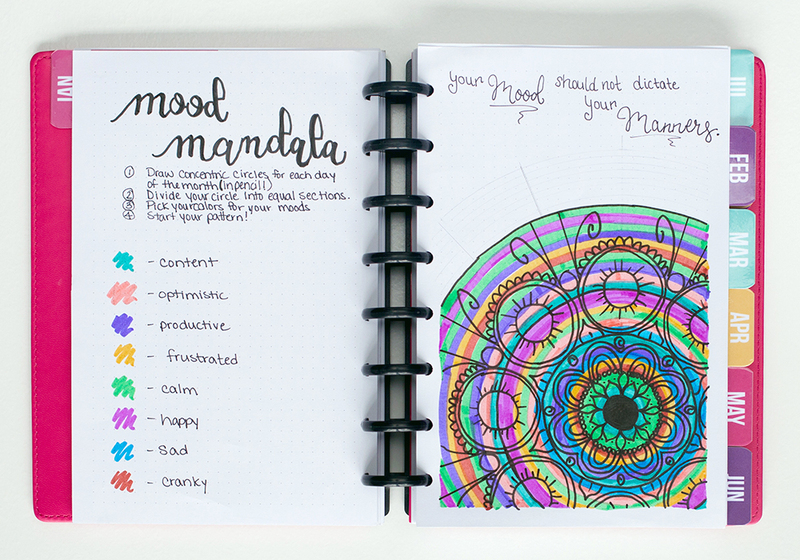 MOOD MANDALA – This is usually a two-page spread with circles representing each day of the month. You then shade in each circle with the color corresponding to your mood for that day. 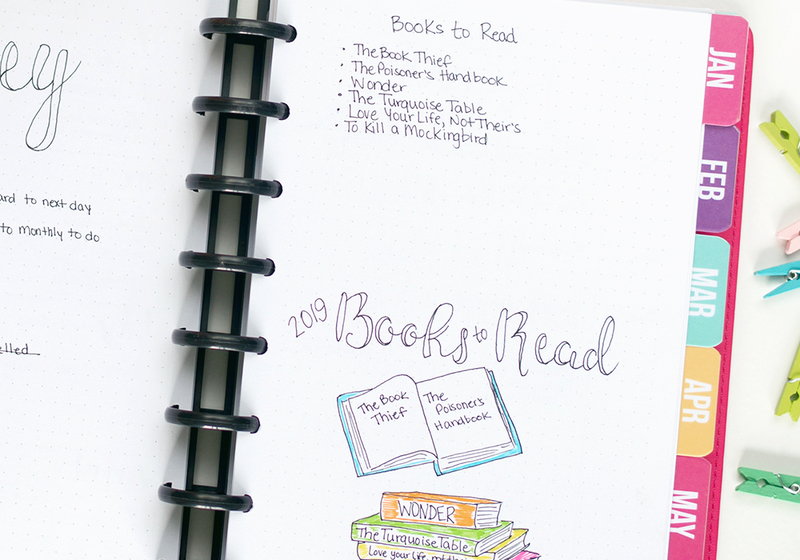 BOOKS TO READ – I’ve seen a books-to-read list in many bullet journals! CALENDEX (version of a future log) – a calendex is a fancy version of a future log (just a list of events happening in the future). I like how visual it represents a large chunk of time! WEEK ON 2 PAGES LAYOUT – This is exactly what it sounds like where you can view your entire week on a two page spread. A lot of people even get artistic with it like this example. RAPID-LOGGING – this is the short-form notes that you use throughout your collections, known as bullets. These are short sentences to help you remember your tasks, events and other important things for that day and/or collection. MIGRATION – This is the part of bullet journaling that can be life-changing! You’ll be analyzing and prioritizing like never before. You will migrate tasks from your Daily Log into your new Monthly Log that you still want to get accomplished and cross out the things you don’t need anymore. 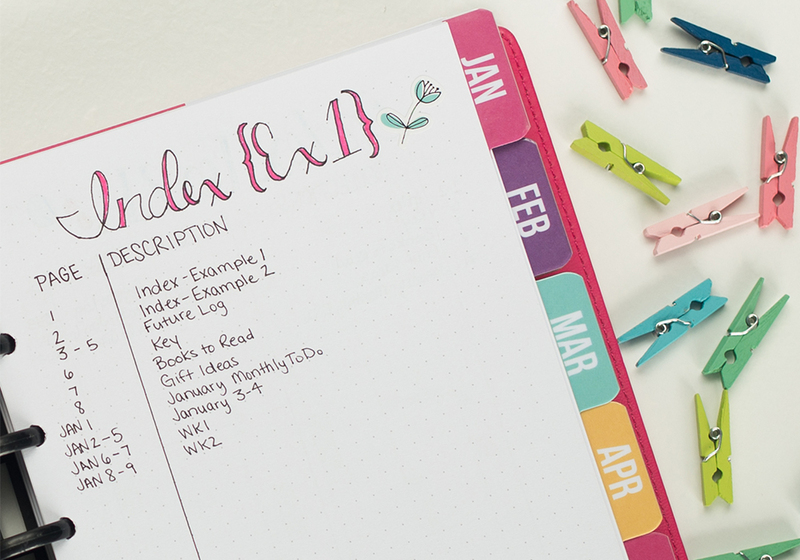 If you want to make bullet journaling really easy PLUS increase your likelihood of sticking with it, I recommend getting a head start by using a planner and bullet journal combo like this one which we call the “bujo planner”. 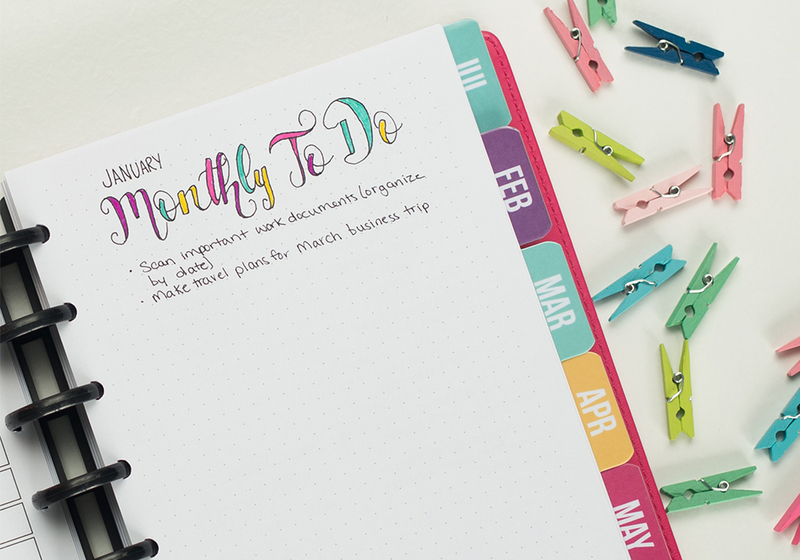 The beauty of this is that a lot of the work is already done for you, plus it has monthly tabs making it super easy to navigate to any spot in the bujo planner. It uses the discbound system so you can add, rearrange, or move pages however you would like. Each month includes a pretty divider tab page, a monthly overview page, a monthly calendar layout (it’s super nice to not have to draw this yourself), a monthly goals list, a habit tracker (also saves a ton of time not having to draw this yourself), and a gratitude list. It comes with 100 dot grid pages that you can place wherever you want in the bujo planner. That’s where you can add your daily plans, week on 2 page layouts, or whatever else you want. I also recommend adding a couple of the dot grid pages at the very beginning to create your index. When you create your index, I recommend numbering your pages starting with 1 until you get to January. Once you get there, number with Jan-1, Jan-2, and so on. 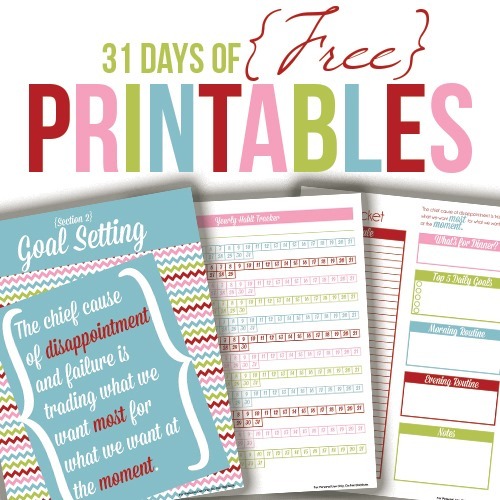 That way you can keep adding pages to each month without messing up your page numbering. 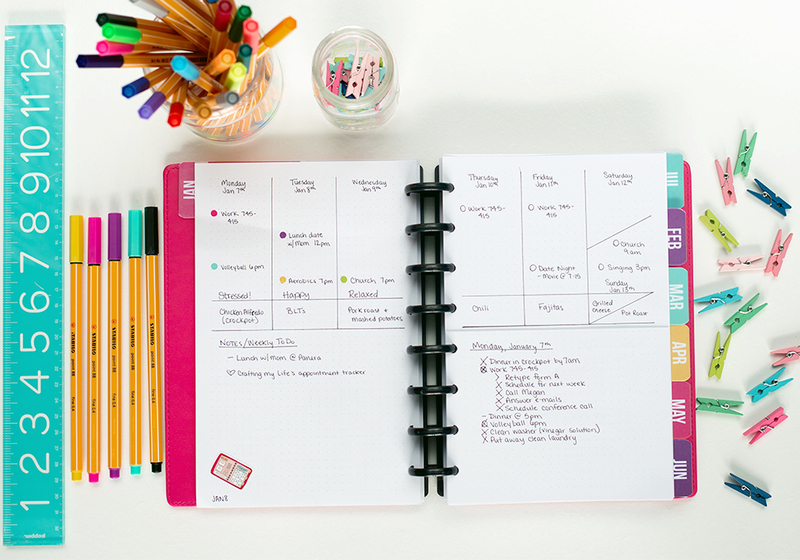 Click here to see all the bujo planner details. I hope that helps you learn a little more about bullet journaling – and don’t forget to watch the corresponding video. 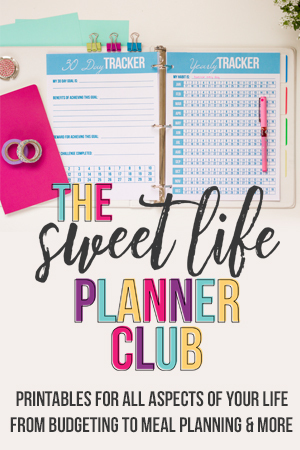 I can’t wait to see how you incorporate bullet journalling into your regular planning! Can we buy a journal from you! I loved the post and video about bullet journaling. You are an inspiration. Thank you!